This summer, I had the opportunity to lead the Crafts Station at my local day camp. In brainstorming craft ideas, I came up with origami. Origami has always been one of my favorite pastimes, so I thought it would be fun to introduce it to the campers. 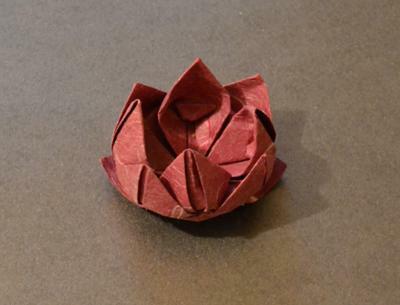 I searched online for origami websites I could cite from in making instructions, and I found Origami-fun. Not only were the origami amazingly cute, cool, and simple enough for kids, they had beautifully designed crystal-clear instructions for me to use. I folded examples of each origami design, partly for the campers to see but also to make some of my own. The kids took to the origami immediately. The lotus turned out to be one of my and the campers' favorites, because it uses generally simple folds but ends up looking complicated and amazing. I had an awesome time teaching them the art of paper folding, and they had an equally awesome time with their finished products. I also had the chance to bring in one of my first origami projects from my elementary origami club, which was a crane chain of sorts. A piece of string connects six cranes together, with beads in between each of the birds. I remember being very proud of it, and for all these years I had it hanging from my ceiling where I could admire it until I fell asleep. I was very glad that I could give the campers something to be proud about, and I hope I inspired some of them to continue folding after camp ended. Origami-fun turned out to be my main source for origami ideas. It was a big part of these kids' origami experiences, but also a big part of mine. Thank you for being here.